A Wrinkle in Time can be classified as science fiction or fantasy, or both. The plot includes something called a tesseract where space and time are folded together. There's an evil dark force, a missing father and three school children with varying problems. Describing Madeleine L'Engle's famous children's novel in a concise, understandable way is not easy. This book was first published in 1962 - when JFK was president and The Beatles had yet to have a top 10 hit - and it has never been out-of-print. Imagine trying to capture the essence of this iconic, Newbery Award-winning novel in a single piece of artwork? That's the challenge faced by several artists over the decades. Here's a selection of covers for our favorite children's story about the space-time continuum. 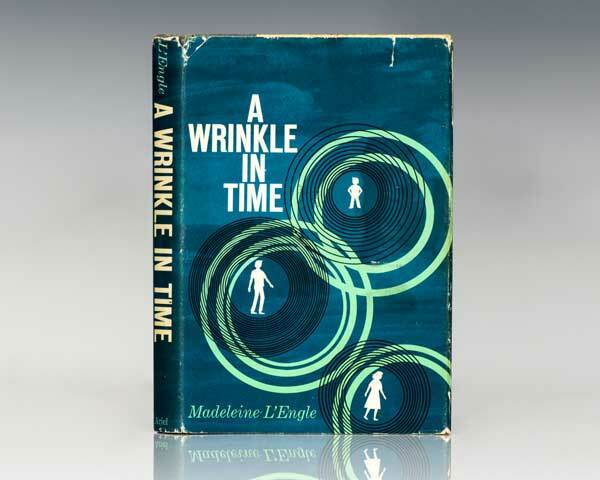 A Wrinkle in Time is a highly collectible book - the most expensive copy to sell via AbeBooks was a signed first edition that went for $11,000 in 2015. Current prices for 1962 first editions range from $7,500 to $17,600 depending on condition and whether L'Engle signed the book. 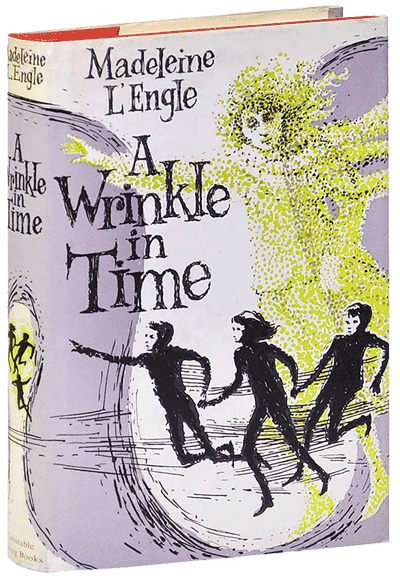 Published on New Year's Day 1962 by Farrar, Straus & Giroux, A Wrinkle in Time's original dust jacket is hard to beat. It was designed by Ellen Raskin, who became famous as the author of The Westing Game. Raskin was an accomplished artist who worked on hundreds of book covers. She used a moody blue and circles to convey the theme of distance and remoteness. Constable published L'Engle's novel in the UK and Anthony Maitland designed the beautiful wraparound dust jacket art. Maitland describes the three children seemingly floating through space and attempted to visualize Mrs. Who, Mrs. Which, and Mrs. Whatsit (on the front and rear covers) in an ephemeral way. Maitland designed dozens of children's books in the 1960s, 1970s and 1980s. Although Raskin's cover is more famous, Maitland's may be the better design. Husband and wife design team Leo and Diane Dillon created this artwork at the tail-end of the 1970s and it could have been a Yes album cover. More fantasy than science fiction, this cover is indicative of the design styles used in publishing at this time. Many younger readers will own this Square Fish edition, first released in 2007 with an appreciation from novelist Anna Quindlen. Jennifer Brown contributed the artwork, which covers space, Mrs. Who, Mrs. Which, and Mrs. Whatsit, a centaur and the mysterious city. Hope Larson's graphic novel rendition was the first illustrated version of L'Engle's novel and successfully carries the complex narrative via words and pictures. A welcome addition, it seems strange that a book about good, evil and science fiction, adored by millions, wasn't illustrated much earlier. 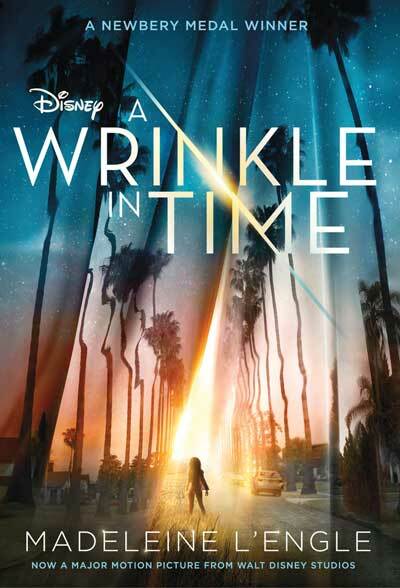 The cover of the 2017 edition issued to coincide with the movie release, starring Oprah Winfrey, Mindy Kaling and Reese Witherspoon, doesn't even attempt to unravel Meg's travels through space and time. With a bright light shining down from the sky, this cover looks like something from the X-Files. L'Engle's first novel was called The Small Rain. Published in 1945, it is a semi-autobiographical novel about the many difficulties faced by pianist Katherine Forrester between the ages of 10 and 19. In 1982, a sequel was published, called A Severed Wasp, in which Katherine appears as an elderly widow. L'Engle married actor Hugh Franklin in 1946. They had two children and adopted a third. 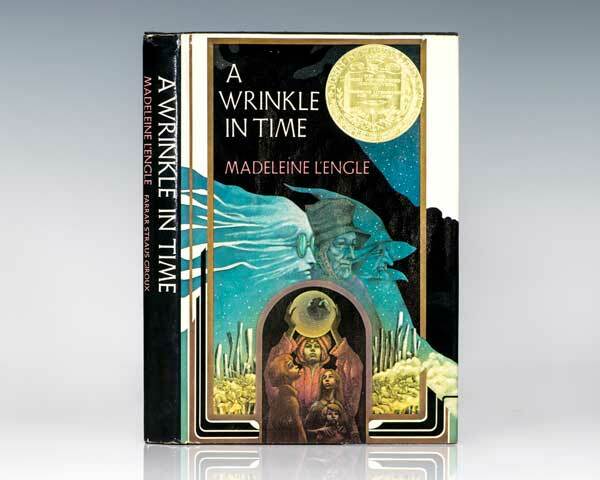 A Wrinkle in Time is first part of a quintet - the other titles are A Wind in the Door (published in 1973), A Swiftly Tilting Planet (1978), Many Waters (1986), and An Acceptable Time (1989). A Wrinkle in Time was rejected by dozens of publishers, many of whom thought the plotline was too complex for children. Tesseract is not a fiction term. In geometry, the tesseract is a four-dimensional analog representation of a cube. A Wrinkle in Time has a famous opening line - "It was a dark and stormy night." This line was first used by English author Edward Bulwer-Lytton in his 1830 novel Paul Clifford. 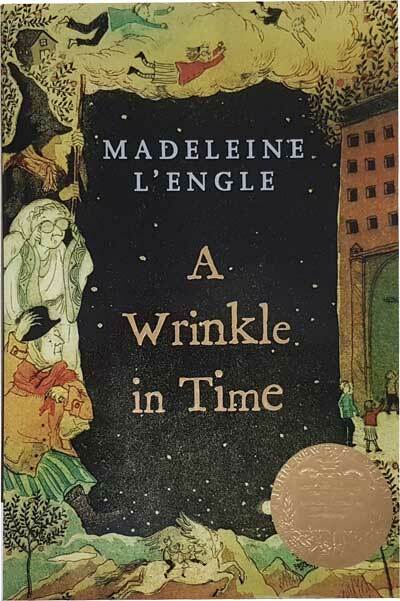 A Wrinkle in Time won the Newbery Award in 1963. This award is given to authors for an outstanding contribution to American literature for children. Other winners include Susan Cooper, Ellen Raskin, Katherine Paterson, Lois Lowry, and Neil Gaiman. In her Newbery Award acceptance speech, L'Engle referenced several books as influential in her childhood. They were The Story of Doctor Doolittle by Hugh Lofting, Invincible Louisa by Cornelia Meigs (a biography of Louisa May Alcott), Smoky the Cowhorse by Will James, and the historical children's books of Hendrik Willem van Loon. Wheaton College in Illinois maintains a special collection of L'Engle's papers and other materials, dating back to 1919, a year after the author's birth. L'Engle died in 2007. There's a crater on Mercury named after L'Engle. Incidentally, HG Wells and Jules Verne both have craters on the Moon named after them. 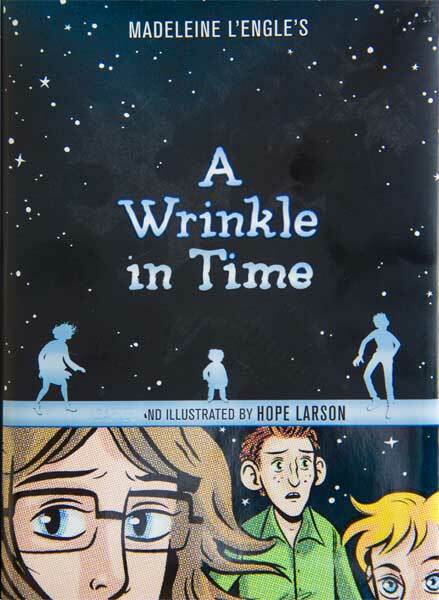 What are your memories of reading A Wrinkle in Time?